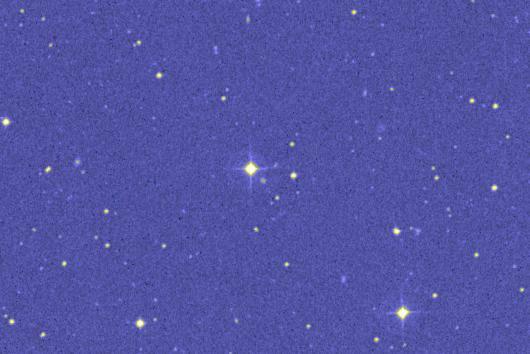 Previously well known as Ross 780, this dim star lies around 15.2 light-years (Plx=214.6 ± 0.2 mas) from Sol (Benedict et al, 2002). It is located in the southeastern part (22:53:16.74-14:15:49.32, ICRS 2000.0) of Constellation Aquarius, the Water Bearer -- north of Skat (Delta Aquarii), east of Tau Aquarii, and south of Hydor (Lambda Aquarii). Like other red dwarf stars, however, it is not visible to the naked eye. The high proper motion of Gliese 876 may have been noticed first by Frank Elmore Ross (1874-1960), who reported on this star in February 1928 with his "Sixth List of New Proper-Motion Stars," Astronomical Journal (38:900). However, many astronomers now refer to this star by its designation in the famous Gliese Catalogue of Nearby Stars (CNS, now ARICNS database) of Wilhelm Gliese (1915-93), who was a longtime astronomer at the Astronomiches Rechen-Institut at Heidelberg (even when it was at Berlin). On June 22, 1998, two independent teams of astronomers announced the discovery of a Jupiter-class planet in close orbit around this star (Science News article -- details below). Subsequently, astronomers announced the discovery of a second, even closer orbiting, Jupiter-class planet on January 9, 2001 (Science News article and news brief from NASA's Astrobiology Institute -- details below). On June 13, 2005, a team of astronomers announced the discovery of a third, probably rocky, innermost planet of at least 7.5 Earth-masses (NSF press release -- details below). dwarf star with a ringed, giant planet. 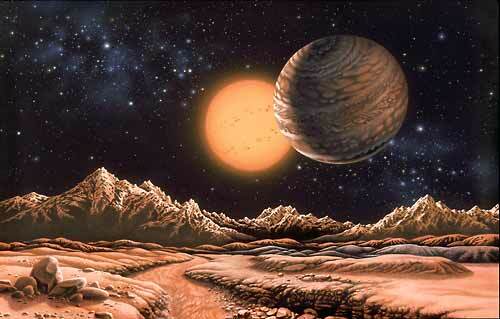 876's two inner giant planets (more). On June 22, 2010, a team of astronomers submitted a pre-print on their discovery of a Uranus-mass, fourth planet "e" in a 124-day, outer orbit around two larger Jupiter- and Saturn-class planets "b" and "c" and innermost super-Earth planet "d" around Gliese 876. The three giant planets (b, c, and e) have 4:2:1 resonance orbits, where the innermost giant planet completes four orbits for every orbit by the outermost giant, and completes two orbits for every two orbits by the middle giant. Hence, the three giant planets should nearly line up every 124 days and come close to a triple "planetary conjunction" (Ken Croswell, Science Now, July 2, 2010; and Rivera et al, 2010 -- more below). 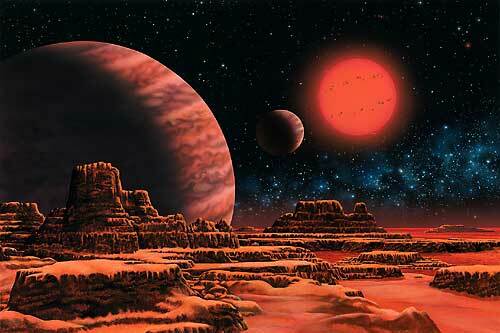 Gliese 876 is a very cool and dim, main sequence red dwarf (M3.5 V). Compared with our Sun, Sol, this star may have about a third (32 percent - exoplanets.org) of Sol's mass, possibly 36 to 39 percent of its diameter (Johnson and Wright, 1983, page 703; and NASA Star and Exoplanet Database, derived from Kenneth R. Lang, 1980), and a bit more than a thousandth (around 0.0016) of its visual luminosity. 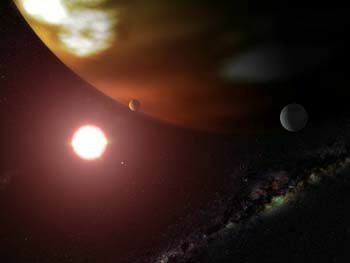 However, if all wavelengths such as the much more abundant infrared radiation generated by red dwarf stars are included, the absolute bolometric luminosity of Gliese 876 is estimated to be much greater -- 0.012 to Solar (Extrasolar Planets Encyclopaedia) to 0.014 Solar (Geneva Extrasolar Planet Search Programmes; Jones and Sleep, 2003; and NASA Star and Exoplanet Database, derived from Kenneth R. Lang, 1980). The star is probably around 2.5 times as enriched as Sol in elements heavier than hydrogen and helium based on the abundance of iron relative to hydrogen (Rivera et al, 2010; Johnson and Apps, 2009; Bean et al, 2006; and Ken Croswell, 2006). It has a rotational period of at least 40 days (Rivera et al, 2010). 623 A (M2.5V) and B (M5.8Ve) at lower right. The star is neither young nor elderly. It lacks a detectable, circumstellar dust disk and is chromospherically inactive, which suggests that it is more than one billion years old. However, its space motion is slow, which suggests that Gliese 876 is less than 10 billion years old. (For further details, see Trilling et al, 2000 and 1999; Marcy et al, 1998, in postscript; and Marcy et al, 1987.) Gliese 876 is a variable star with the designation "IL Aquarii." Some other useful star catalogue designations include: IL Aqr, Gl 876, Hip 113020, BD-15 6290, G 156-57, LHS 530, LTT 9244, LPM 841, LFT 1745, Vys 337, and Ross 780. Since this red dwarf star is so cool and dim, an Earth-type rocky planet would have to be located very close to Gliese 876 to be warmed sufficiently to have liquid water at the surface. According to one type of model calculations performed for the NASA Star and Exoplanet Database, the inner edge of Gliese 876's habitable zone should be located around 0.117 AU from the star, while the outer edge edge lies around 0.228 AUs; however, calculations from another source estimate a slightly more close-orbiting habitable zone between one to two tenths -- 0.112 to 0.221 AU -- of the Earth-Sun distance (Jones and Sleep, 2003, given a bolometric luminosity around 0.0124. Hence, planets "b" and "e" would orbit outside of the the star's habitable zone, while planets "c" and "d" orbit near the inner and outer edges of the habitable zone, respectively. 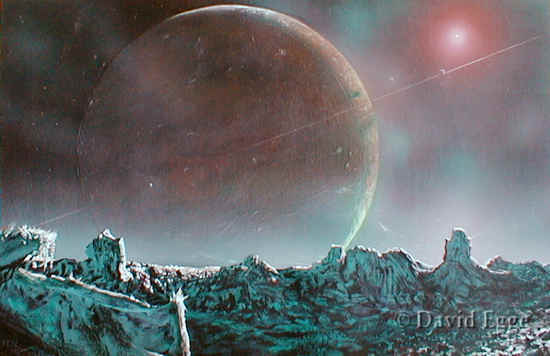 Although planets c and d are presumed gas giants that would lack a rocky surface, they could have moons with sufficient mass and atmospheres to maintain liquid water on their surfaces. 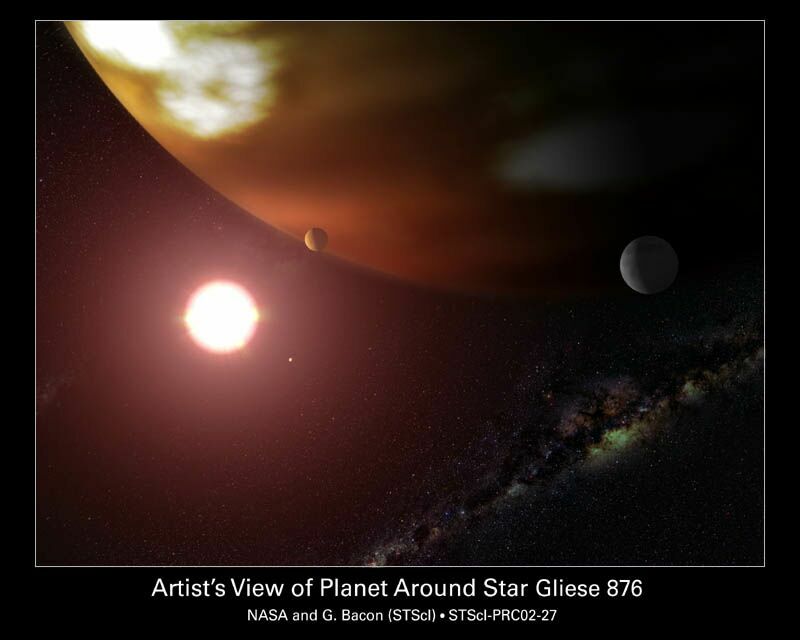 As of June 22, 2010, astronomers have found four planets in orbit around Gliese 876 (Ken Croswell, Science Now, July 2, 2010; and Rivera et al, 2010). Planet "c" - On January 9, 2001, the team of astronomers led by Geoffrey W. Marcy and R. Paul Butler announced that a second Jupiter-class planet is orbiting even closer to Gliese 876 -- semi-major axis of 0.13 AU -- than the previously designated, "Gliese 876 b" (Science News article; news brief from NASA's Astrobiology Institute; and Marcy et al's unrefereed paper in postscript). 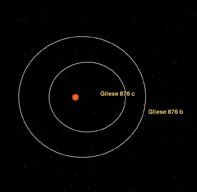 With over half (0.714 +/- 0.004) the mass of Jupiter, this second planet (designated "Gliese 876 c" in the orbit diagram below) orbits its host star in only about 30 days, about half that of the other planet (see estimated orbital data at U.C. Berkeley; and Rivera et al, 2010). Thus, the orbits of the two planets are "locked" into a near 2:1 resonance, shepherding each other to maintain a stable synchrony of elongated orbits. The orbit of Gliese 876 c is also more elliptical (e= 0.26), even more than that of the planet Pluto in the Solar System. 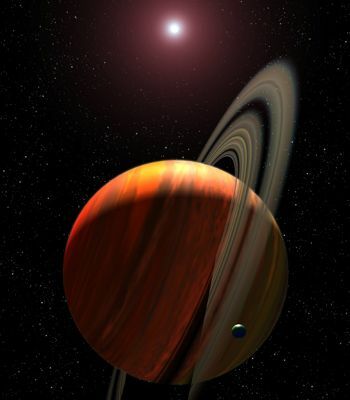 Planet "b" - On June 22, 1998, two independent teams of astronomers announced the discovery of a Jupiter-class planet around this star (Science News article). Geoffrey W. Marcy (now with U.C. Berkeley and San Francisco State University) and his colleagues (R. Paul Butler with the Carnegie Institution and the Anglo-Australian Observatory, Steven S. Vogt of the University of California at Santa Cruz, Debra Fischer of U.C. Berkeley, and Jack J. Lissauer with the NASA Ames Research Center) began studying Gliese 876 in 1994 at Lick Observatory on Mt. Hamilton in California but expanded their radial velocity analysis of this very dim red dwarf using the powerful Keck Observatory on Hawaii's Mauna Kea (SFSU web page on Gl 876; and Marcy et al, 1998, in postscript). The other team (including Thierry Forveille, Michel Mayor, and Christian Perrier, and led by Xavier Delfosse of Geneva Observatory in Switzerland and Grenoble University in France) used spectrometers at the Haute-Provence Observatory (OHP) in France and the European Southern Observatory in La Serena, Chile (OHP web page on Gl 876; and Delfosse et al, 1998, in postscript). left, as imagined by Bacon. In 2010, the planet (designated Gliese 876 "b") was given an updated, estimated mass of 2.276 +/- 0.004 Jupiter-masses based on more precise astrometric calculations of its host star's movements made possible with the Hubble Space Telescope (Benedict et al, 2002). Although astrometic calculations suggested an inclination of 84 +/- 6° degrees from Earth's line of sight and a perturbation semi-major axis of alpha = 0.25 ± 0.06 mas (Benedict et al, 2002), the discovery of three additional planets by 2010 now provides an best-fit inclination of 59.5° (Rivera et al, 2010). It is probably located at an "average" distance (semi-major axis of orbit) of about one-fifth of Earth's orbital distance (0.21 AU, e= 0.032) -- about half of Mercury's orbital distance -- in the Solar System, with an orbital period of around 61 days (Rivera et al, 2005). 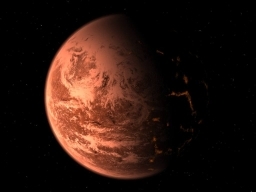 Despite its close orbital distance, Gliese 876 is so dim that the presumed gaseous surface of the planet has a temperature around -75° C (-103° F) -- far below the freezing point of water -- according to calculations by Didier Saumon of Vanderbilt University. However, water could exist as liquid droplets in warmer layers not far below the surface of the planet. Planet b's close-in orbit takes only 61 days to complete. Outside this inner orbit, residuals in the data collected suggest that there are no other Jupiter-class planets (or brown dwarfs) in an orbit that takes four Earth years or less to complete (Marcy et al, 1998, in postscript; and Marcy and Benitz, 1989). Furthermore, past analyses with infrared speckle interferometry indicated that the star does not have large companions between one and 10 AU of the star (Henry and McCarthy, 1990; and Leinert et al, 1997). Planet "e" - On June 22, 2010, a team of astronomers submitted a pre-print on their discovery of a Uranus-mass, fourth planet "e" in a 124-day, outer orbit around two larger Jupiter- and Saturn-class planets "b" and "c" and innermost super-Earth planet "d" around Gliese 876. The three giant planets (b, c, and e) have 4:2:1 resonance orbits, where the innermost giant planet completes four orbits for every orbit by the outermost giant, and completes two orbits for every two orbits by the middle giant. Hence, the three giant planets should nearly line up every 124 days and come close to a triple "planetary conjunction" (Ken Croswell, Science Now, July 2, 2010; and Rivera et al, 2010). The following star systems are located within 10 ly of Gliese 876. Up-to-date technical summaries on Gliese 876 can be found at: Jean Schneider's Extrasolar Planets Encyclopaedia, Astronomiches Rechen-Institut at Heidelberg's ARICNS, the NASA Star and Exoplanet Database, and the Research Consortium on Nearby Stars (RECONS) list of the 100 Nearest Star Systems. Additional information may be available at Roger Wilcox's Internet Stellar Database. See also John Whatmough's illustrated web pages on this system in Extrasolar Visions. Aquarius was "Latinized" by the Romans from Ganymede in Greek mythology, who was "cup-bearer to the gods." For more information on stars and other objects in Constellation Aquarius and an illustration, go to Christine Kronberg's Aquarius. For another illustration, see David Haworth's Aquarius.